Remember those Freezer Sausage and Egg Burritos I make when Ryan decided he needed a break from cereal? My sister in law took it one step further one weekend and made a batch of breakfast burritos along with a batch of lunch burritos (documented on her blog here!). Can you ever go wrong with more burritos? I think not, especially when the wife is scheduled to be out of town! I had a weeklong business trip to Memphis a few weeks ago and wanted to make sure Ryan was well-fed while I was away. I already had a few things stashed away for him in the freezer, like that BBQ pulled pork I recently posted, but needed something else for the few dinners I'd be away (note--he is perfectly capable of preparing his own meals, I just like to spoil him and know he appreciates not having to make dinner, even when the regular chef is away!). These couldn't have been easier to prepare. I made some rice and stirred a can of Rotel tomatoes and chilies into it, poached and shredded some chicken, and cracked open a can of refried beans. On each tortilla went some beans, rice, chicken, and cheese, which I then folded up, wrapped in plastic wrap, and stuck in a freezer bag. Much like the breakfast burritos, a quick cook in the microwave and these are ready to be eaten! Serve with your favorites--salsa, sour cream, and/or guacamole! Perfect for work/school lunches, grab 'n go meals, or husbands with traveling wives! 1. Place a tortilla on a cutting board. Spread a layer of refried beans across the middle of the tortilla. Top with the rice mixture and chicken. Sprinkle with desired amount of cheese. 2. Fold tortilla up like a burrito (instructions found online here, but you'll need to tuck both ends in). Wrap tightly in plastic wrap. Repeat with remaining ingredients. 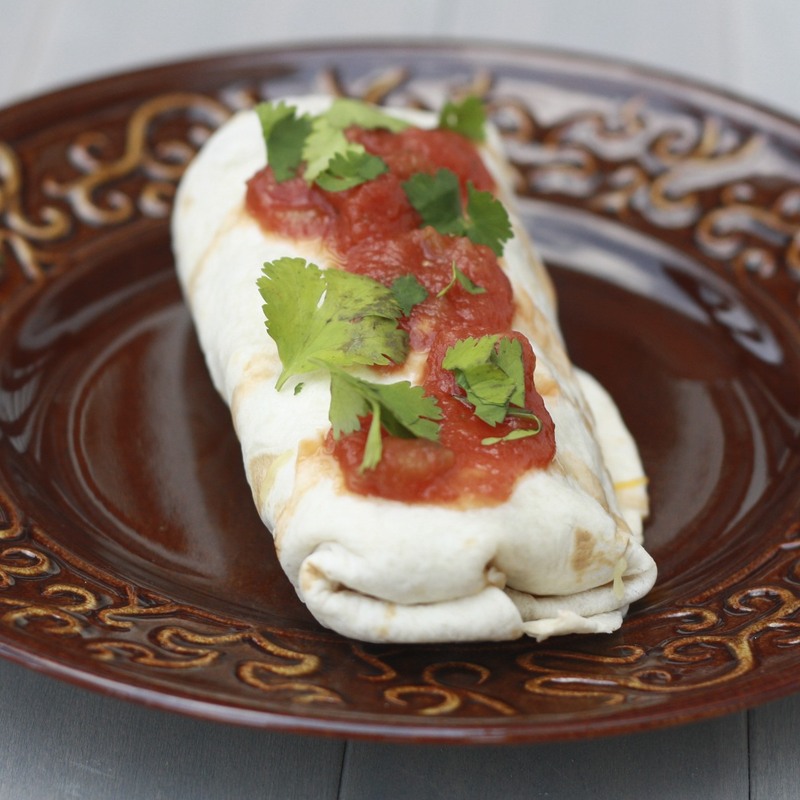 Place wrapped burritos in a freezer bag and store in the freezer. To serve, unwrap from plastic wrap, and place in a damp paper towel. Microwave for 1-2 minutes (depending on strength of microwave) to reheat.